Elton John. Will paparazzi leave him alone this time? After long negotiations, it's finally official: Sir Elton John will return to Israel and perform at the Ramat Gan Stadium on June 17, exactly 17 years after his previous Holy Land concert. The veteran British singer's arrival was confirmed Tuesday by producer Marcel Avraham. The concert will be sponsored by Bank Discount, which plans to invest some NIS 4 million (about $1 million) in the event. Many tickets will be offered to the bank's customers for special prices. Some 15,000 tickets will be on sale for grass seats and about 32,000 for gallery seats. Bank Discount's customers will pay NIS 250 to NIS 900 ($68 to $245) per ticket. Regular tickets will be sold for NIS 350 to NIS 1,000 ($95 to $272). Tickets will go on sale on February 9 for the bank customers, and four days later for the broad public. This will be Elton John's third visit to Israel. He first performed in Tel Aviv in 1979. In 1993, after being attacked by dozens of paparazzi as he landed in Israel for his second concert, John fled the country and canceled his performance. Following many attempts to persuade him to return, he flew back to Israel the next day and performed at Tel Aviv's Yarkon Park. John was hospitalized in London about two months ago after contracting a bacterial infection and the flu. Upon his recovery, he resumed his concert tour. 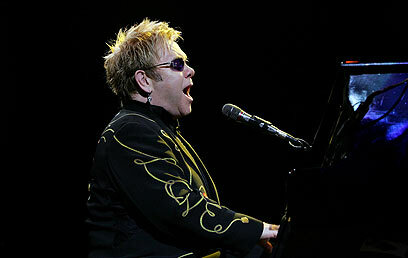 See all talkbacks "Elton John's Israel concert booked"